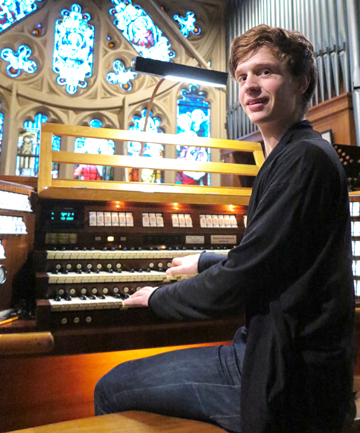 18 year old Thomas Gaynor, winner of the 2009 ORGANZ Organ Performance Award from the 2009 Congress, achieved another major triumph as the recipient of the inaugural Maxwell Fernie Centenary Award. The presentation of the award was made by the Minister for the Arts, Hon. Chris Finlayson, himself a friend of Maxwell Fernie, at St Mary of the Angels Church in Wellington where Fernie presided over the music from 1958 to 1999. The scholarship provides funding for overseas travel that will enable Thomas to receive coaching from leading European players and experience some of the continent’s fine organs. This will be arranged by one of the judges, distinguished New Zealand organist Dr Christopher Hainsworth, a former Maxwell Fernie student now resident in the south of France. In addition, the award will help Thomas with tuition costs for his organ studies with Douglas Mews at the Victoria University School of Music. It also includes work and study with the South Island Organ Company to develop his knowledge of organ building and tonal design. And finally, Thomas will have the opportunity to contribute to the Sunday liturgies at St Mary of the Angels where so much of Maxwell Fernie’s musical life was centred. Thomas is in his first full year of study at Victoria University’s School of Music, but last year, in his final year at Wellington College, he achieved 70 university music credits in what he concedes was a stressful year! Those 70 credits represent about 20% of the 350 he needs for the degree of Bachelor of Music. Thomas leads a busy musical life. He accompanies choirs, sings with the Wellington Cathedral Choir, teaches the piano and plays the organ at various Wellington churches. He has won organ competitions in New Zealand and Australia and, as a pianist, accompanied Wellington’s Kotuku Choir on a tour of the United States and United Kingdom in 2007-08. His ultimate ambition is to gain a position as a music lecturer and organ teacher at a university, as well as possibly being a church organist. Thomas grew up in a musical family in Tawa. At 10 he began piano lessons with Russian teacher Svetlana Kalinakova. Three years later he began learning the organ with young British organist Max Kenworthy, then assistant organist at Wellington’s Cathedral of St Paul. He also took piano lessons for three years with one of the capital’s finest teachers, Judith Clark. He passed Grade 8 on both organ and piano in the same year at age 15.